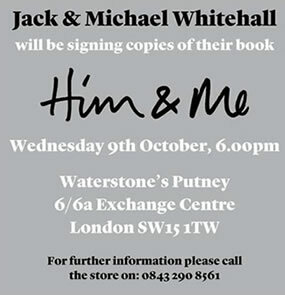 To win a signed copy of 'Him & Me' you must be a registered member. Q: Which Putney nursery school did Jack attend? Please put Whitehall in the email subject field. Jack and his dad Michael introduce us to life chez les Whitehalls in this laugh-out-loud treasure trove of embarrassing, sometimes outrageous but always entertaining family stories. 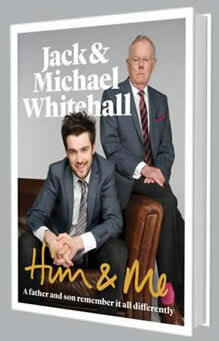 In Him & Me Jack and Michael open up the rich and plentiful family archives and share their hilarious memories with you. Join in the fun as Jack and Michael reminisce about topics such as Jack's nanny's enormous feet, Michael's lifetime touchline ban from Jack's prep-school and the Whitehall collection of downright weird and eccentric relatives. With family photographs and sketches by Jack himself, the result is a hugely entertaining insight into a hilarious and sometimes bumpy journey of self-discovery and into the unique relationship between a father and a son. One lucky member can win a signed copy of the book. Having grown up in Putney, Jack went to The School Room in Putney and then shared his classroom with Robert Pattinson at Tower House School in East Sheen before going to secondary school at Marlborough College. Jack has established himself as one of the UK's most exciting and successful comedy talents, leading him to be crowned King of Comedy at the 2013British Comedy Awards. The devotees that adore and worship Jack are already embracing his lovably grumpy father. Watch out, fans of Reeves & Mortimer, Walliams & Lucas, Morecambe & Wise, there's a new comedy duo in town.